This nation's most hallowed burial ground for its war dead is Virginia's Arlington National Cemetery at Arlington Heights, a beautiful area high above the Potomac River across from Washington D.C. and not far from the Lincoln Memorial. 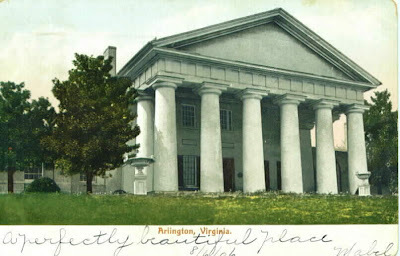 Its centerpiece, Arlington House, was the beloved home of Confederate General Robert E. Lee and his family. It was built in the early 1800s by Martha Washington's natural grandson and the stepson of George Washington, George Washington Parke Custis, who originally dedicated the home to the honor of Washington's memory. He kept many mementoes there from Mount Vernon, his own boyhood home. Custis was Robert E. Lee's father-in-law. During the Civil War it was fortified for the protection of the capital and then used as a refugee camp for freed slaves. In 1864, with Washington D.C. overwhelmed by wounded and war dead, it became the site for a new national cemetery, partly as a spiteful move by a bureaucrat named Meigs to prevent Lee from ever occupying it again as a home. 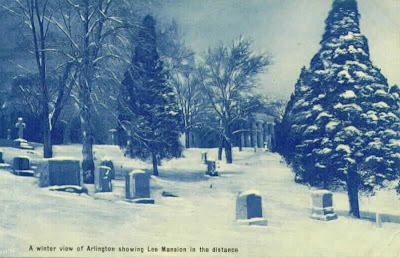 That gravesites should be used to keep Arlington from being used as a residence again is somewhat ironic in that, during the war, Abraham Lincoln spent his summers north of the city in a cottage at the Soldier's Home—which was then an active hospital and sanitorium with a graveyard continually in use for the interment of war dead. It is another gently spectacular spot in the countryside, with beautiful views. Lincoln would commute to the White House between June and November on horseback. 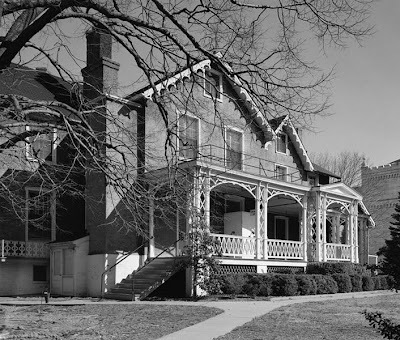 Soldier's Home, which Lincoln is known to have loved, is now one of the few places apart from the White House that still exists largely as Lincoln knew it in his lifetime. In 2008 it will open as a restored national museum. Robert Lee never did return to Arlington. Down the hillside from Arlington House is the Tomb of the Unknowns (also known as the Tomb of the Unknown Soldier), where tourists gather to watch the changing of the honor guard, and at the foot of the greensward that we would call the front yard of the house is where the eternal flame burns for John F. Kennedy, himself a war veteran. I'm glad someone is fianly talking about memorial day without mentioning holiday sales, travels and oh yes, bar-b-q. Thank you for this interesting and educational piece! Last night's "News Hour" television news had a very good story about a new photo book, _Where Valor Rests: Arlington National Cemetery_, which is multiple photographers' images from ANC. I'll have mine in a few days (via Amazon), and will have something to say about it... from the news story alone, though, I'd recommend that TOP order one, then provide a link if it seems worthwhile. I'd love a brief review if you have time to write it for us. I think that you are a good blogger and photographer. I would like to know how I can get my blogs to look as good as yours. I also do photography. I know that there is a science to the madness. I am just getting started blogging, I make time to write but in creating a professional blogsite, if you would share your shrewd advice, I would love your guidance. Just go to blogger.com, pick a template, and get started!